President Muhammadu Buhari’s son, Yusuf, has undergone a successful brain surgery, according to the Guild of Medical Directors. The Guild’s president, Prof. Femi Dokun-Babalola, disclosed this in a statement made available to Daily Sun in Abuja, yesterday. Yusuf had been on admission at Cedarcrest Hospital, in Abuja, after a power bike accident in the city, on Tuesday December 26, 2017. He suffered injuries to the head and limbs. 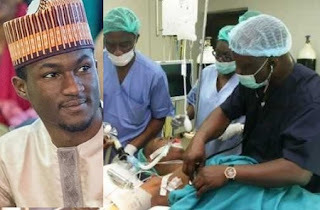 Following denials of plans to move Yusuf out of the country for medical care, there had been speculations that he could be transferred to the National Trauma Centre, at the National Hospital, Abuja. Yesterday, Prof. Dokun-Babalola spoke about Yusuf’s brain surgery and that he has been assessed to be stable. “We are saddened to hear about the unfortunate accident involving the son of our dear president on a power bike. “While we cannot comment on the exact circumstances of the accident, we are happy that the situation is being efficiently handled by Cedarcrest Hospital, in Abuja, one of the top Guild of Medical Directors-owned hospitals in Nigeria. “It is heartening to note that his condition is now stable after undergoing brain surgery and we hope for complete recovery from this unfortunate incident. Our thoughts and prayers are with president Muhammadu Buhari and his family at this time,” the Guild said. Prominent Nigerians, including former President Goodluck Jonathan, Senate President, Bukola Saraki, former Vice President, Atiku Abubakar, have continued to call for prayers for Yusuf’s quick recovery.